Donna Phelan back again! Today I am sharing a Masculine Shaker card that I have made. It's fun, it's easy and it's manly! June is the month we all celebrate the men in our lives. Mine has built me 2 beautiful homes so I have built him this FUN card! Seems about right, aye? 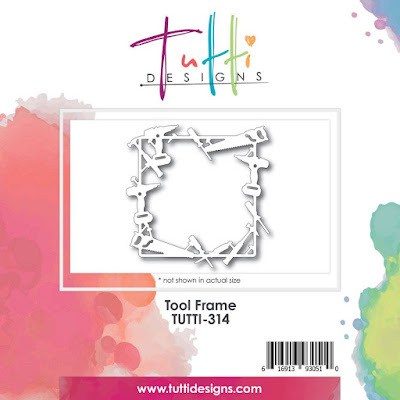 I started with this fabulous Tool Frame by Tutti Designs. Isn't it just fantastic? 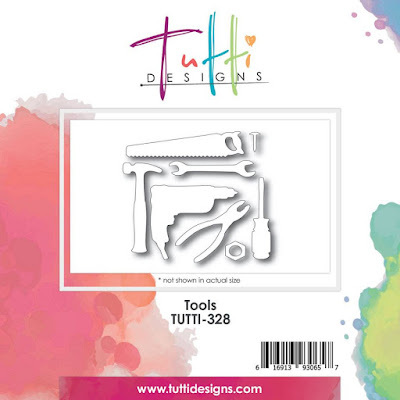 Check out all of the little details; saws, hammers, drills, screwdrivers and even lots of little nails. WOW! Everything a man would love! I also paired it with this perfect die set! These Tools became my 'shaker bits'. I took 2 pieces of Holographic Foiled Toner Paper and adhered them together. They sparkle and shine like crazy! Then I die cut many 'tools' from them. This way if they flipped over, they would still all have the foiled look. I realized that the wrench and pliers would be too big for my Shaker so I have saved them for another project. I cut my Tool Frame 3 times. Once from chipboard, brown card stock and then again from my Foil. I layered them all together making for a nice sturdy frame. I also added red and brown card stocks for handles. Nuts, bolts, nails and even the little 'dots' that came out of the bolts have been used. I also added lots of glitter. Frame built, sentiment stamped and a nice shiny silver brad for an accent. Each Wednesday I will be back to share some new and creative card ideas with you all! OMG this is awesome and what a fabulous idea to make it a shaker using the 'tools' for the bits & bobs. Fabulous inspiration and a card any man would be thrilled to receive! Great job! This is brilliant, simply brilliant!!!! Donna, this card is fantabulous!! The holograph papers looks amazing. So cool! !